Easter is tomorrow and has me thinking about the bunny cake my mom used to make, decorated with jelly bean eyes, coconut fur and licorice whiskers. Alas, the Easter event I'm going to this year is a picnic with no big picnic table, so it's cupcakes this year, decorated "rustically" with some cute stencils a friend gave me ages ago! 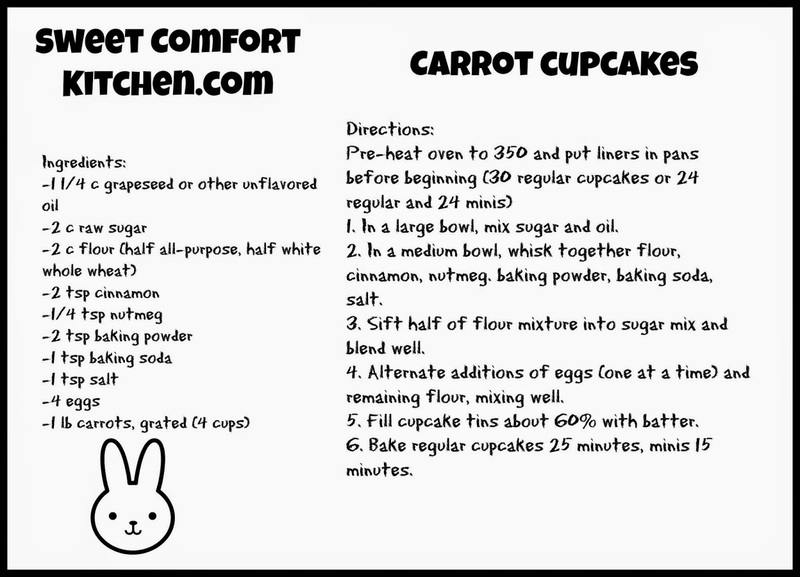 This makes about 30 regular cupcakes or 24 regular plus 24 minis - recipe card between this photo and the detailed instructions. 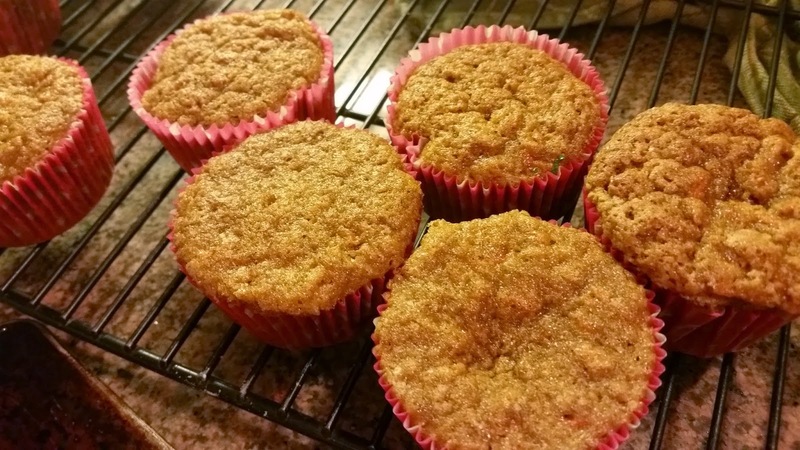 I'm often disappointed by dry spice-cake-with-a-few-carrot-shreds-tossed-in carrot cakes. This recipe has just a little spice, no pineapple, and more than twice the carrot of most recipes I've found. Preheat the oven to 350, with the top rack at the top and the bottom rack one level up from the last level. Line two or three cupcake pans. Peel and grate the carrots. I usually don't bother to peel carrots anymore, but for this I do. You can use a box grater, but me and my lil' food processor got a thing goin' on right now. I got these pretty cupcake papers at a local party store that has very reasonable prices. The ones at the upscale kitchen stores can be very expensive, unless you get lucky and find some on the sale rack! In a large bowl (could be the stand mixer bowl), combine the oil and sugar well. 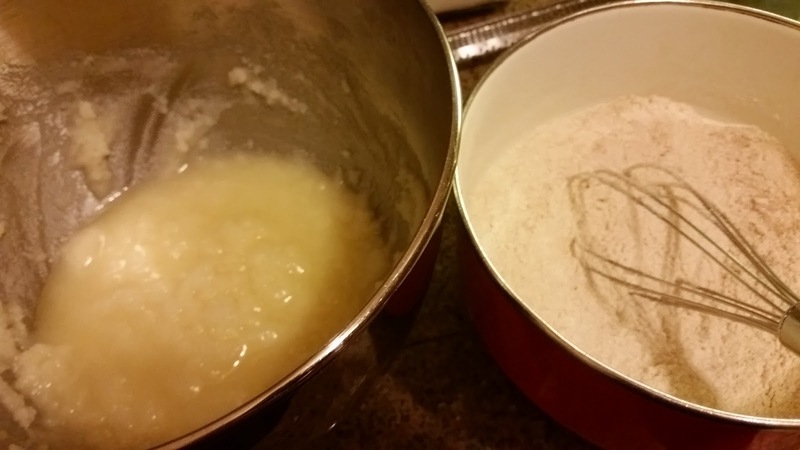 In a medium bowl, combine the flour, spices, baking soda, baking powder, and salt. 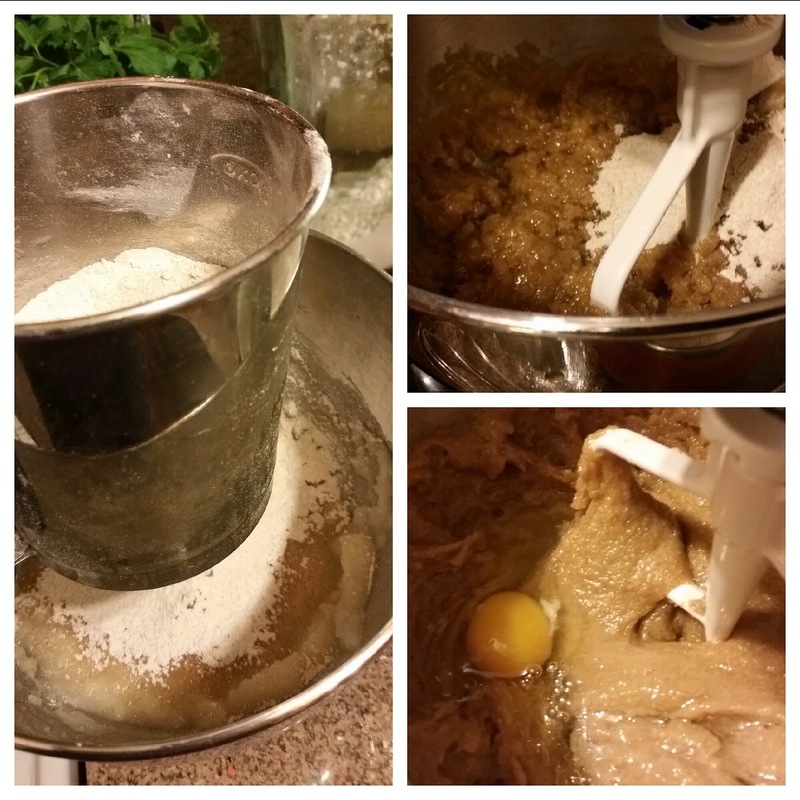 Sift half of the flour mixture onto the oil mixture (no sifter, no problem, just dump it in). Mix well. Add one of the four eggs and mix it in. Add about 1/4 of the remaining flour mixture and mix in. Repeat the above steps until all four eggs and all of the flour is added. You don't HAFTA alternate if you're in a hurry, but this creates a nice light cake structure. It's part of the lovely alchemy of baking. Fill the cups 2/3 full with batter. 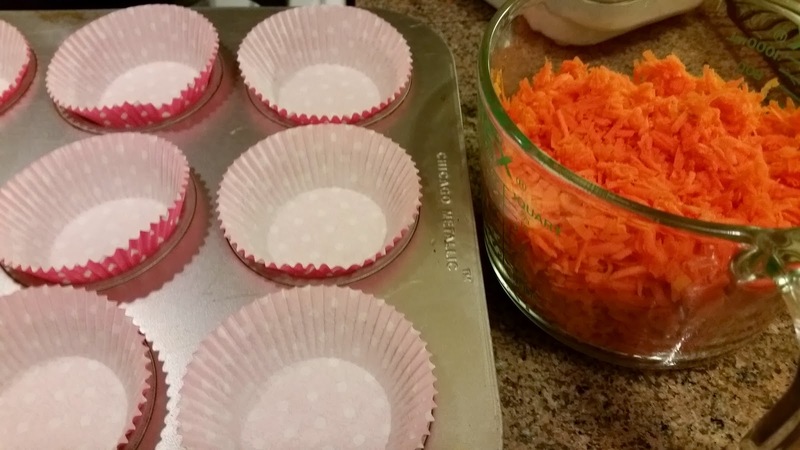 If you have more cups than cake, fill the empties with water to keep the pan from getting too hot. 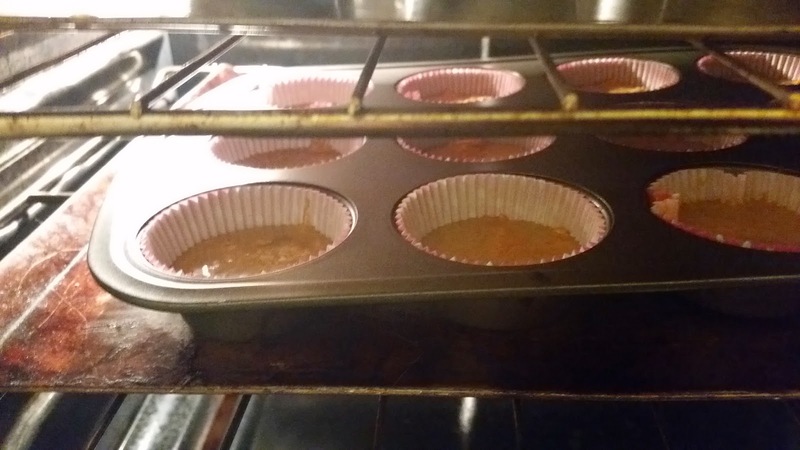 Put the cupcake tins in the oven, one per rack. I had never burned a batch of cupcakes...until last night. Wah! It happened because I put too many pans in at once and they were touching the sides of the oven. Putting the tin on a cookie sheet is another precaution that will help keep the pan from getting too hot. It's probably not necessary, but I'm a little gun-shy! Bake for about 25 minutes (15 minutes for minis), until the tops look just dry or they pass the toothpick test. These probably won't dome up much. Let them cool completely on a rack before icing. 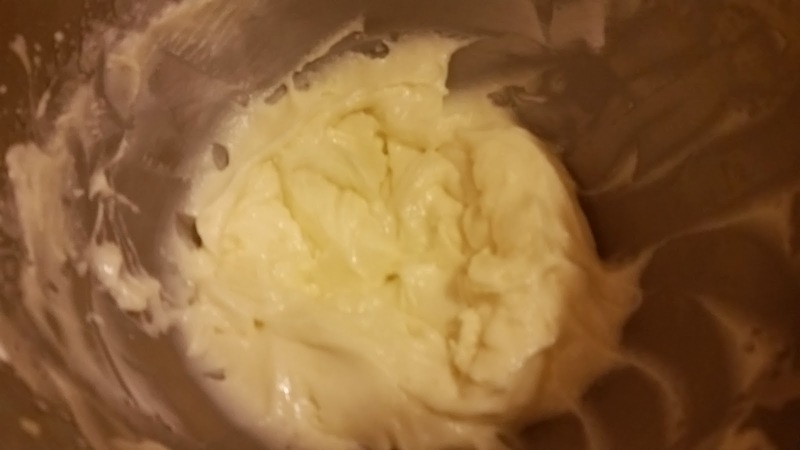 Beat together butter and mascarpone with an electric mixer or a wooden spoon and a strong arm. If some liquid separates, don't worry. Add sugar, salt and vanilla and beat until smooth and well blended. 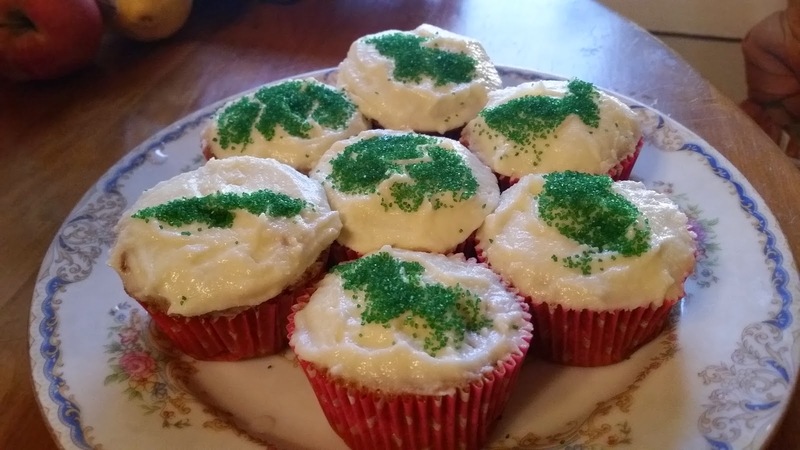 Spread generously onto cupcakes with a table knife or pipe on with a pastry bag. 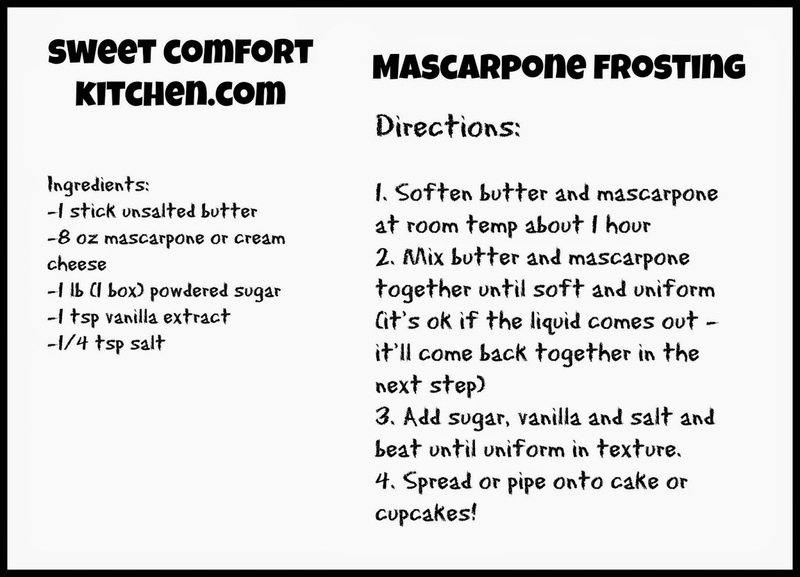 Right click recipe card to save before printing image.